L'Amoskeag est l'usine de textile géante de Manchester dans le New Hampshire où ont travaillé des milliers de Franco-Américains. J'ai déjà présenté l'histoire de cette entreprise écrite par Tamara Hareven et Randolph Langenbach (voir L'Amoskeag sur ce blog). On trouve dans cet ouvrage le témoignage de Cora Pellerin, une ouvrière franco-américaine qui a travaillé à cet endroit de 1912 à 1936. Elle explique le stratagème qu'utilisaient certaines familles franco-américaines pour envoyer leurs jeunes enfants travailler en usine. Ce comportement était interdit par la Loi américaine qui rendait la fréquentation scolaire obligatoire jusqu'à l'âge de quatorze ans. Elle compare sa vie aux États-Unis à celle (qu'elle croit) qu'elle aurait eu si elle était restée au Canada. Précisons que son souvenir du Canada datait de 1912. C'était celui d'une société rurale arriérée. Elle raconte le déchirement éprouvé par son père à l'idée d'abandonner sa ferme. Elle a mené une vie très libre pour une femme de son époque. Cora Pellerin est née sous le nom de Valéda Tourigny le 31 octobre 1900 à Saint-Grégoire dans le comté de Nicolet. Elle était la fille d'Oliva Tourigny et d'Élisabeth Poirier. Elle a épousé Jules Pellerin vers 1930. Ils ont eu deux filles. Valéda Tourigny-Pellerin, alias Cora, est décédée le 2 décembre 1993 à Hillsborough dans le New Hampshire. Pellerin was born in Quebec in 1900, one of sixteen children, and went to work in the Amoskeag mill in Manchester, New Hampshire in 1912. She worked in the mill until it closed in 1936, and then worked in other mills and factories until 1972. She was interviewed in the mid-1970s. When I talk about my work in the mill, to my daughters especially, they think it's a story; and when I say something about living on a farm, to them it's a story. They don't believe it's true that we were that backward. I came from Canada in 1911. I started working in 1912 when I was eleven. My brother-in-law, Bert Molloy, was overseer, and my other boss was John Jacobson....My father and two of my brothers worked in the mills.... We were thirteen in the family; eleven children and my mother and father. My mother had sixteen children, but five of them died as babies. When I was eleven, my father had a birth certificate made for me in the name of my sister Cora, who died as a baby, because you couldn't go in to work unless you were fourteen. I worked in the old Amoskeag as Cora, but I was naturalized [as a US citizen] in 1936 as Valeda. Now I stick to Valeda because of my Social Security, but everyone knows me as Cora. My father didn't want to sell his farm in Canada. He cut the first tree when he was thirteen years old in the forest where he made that farm. He was a farmer, and that was his life. He came to the States because my mother was brought up here, and she talked my father into bringing the whole family together to Manchester [New Hampshire]. People were doing that in Canada. When they had three of four children that could work, they would come out for a few years to make money, and then they'd go back to the farm. It took my father a long time to decide. They came and stayed for three years; and when they went back in 1914, I was thirteen and working here, so I begged my mother to leave me. My mother said, "If I can find a good boardinghouse, I'll let you stay." So she found a family-style boardinghouse that would take me, my sister and my brother. So my mother went back to Canada and we stayed here, but I'm the only one in my family who has always lived in Manchester. If I wanted to go back on the farm, I'd have to go work in private houses in Montreal and Quebec, take care of the house, wash clothers, help with the food, and whatever there is to be done. Housemaid. My mother didn't want that.... When I was a little girl, I liked it on the farm in Canada. But I didn't miss it, because for me it was paradise here in Manchester. Everything we had on the farm was for a purpose. When we used to go to school, we'd stop and pick up seom berries. We'd bring strawberries or raspberries or blueberries or maple syrup to the village, and the ones that didn't have any farms would give us sugar or some food. We'd exchange that instead of money. I didn't want to live that way, not after I got my pay every other week. Live on a farm, raise eight, ten kids - oh no!... And in the winter, the snow was so high it would come all the way up to the windows. We had a sled. I remeber we sat on the floor of the sled and they put a big fur rug on top of us; that's how we went to church. Otherwise we'd freeze to death. I never missed Canada. My life is more American. I worked in Canada during the strike of 1922, in Trois Rivières, but I would never go back there to live. It was paradise here because you got your money, and you did whatever you wanted with it. When I first started in the Amoskeag, I worked in the spinning room in the Amory Mill. We all worked together. The spinning room was for young girls. We used to dance in the aisles. We'd go in the hallways, and one would watch for the boss while the other one took care of our work. We danced, and a Greek boy played the harmonica. We thought the weave room was for married women and old maids. When I was seventeen, I got my own room. I lived there for four years, and then I got an apartment all by myself.... Not too many women were living alone in their own apartments. I was a wildcat. Some mothers of my girlfriends, after they knew I was in an apartment, they didn't want their daughters to chum around with me any more. In those days, if you lived alone in a room, they were afraid their daughters would get the idea. I had me own home, I had everything. I cooked my own food. I knew my husband for ten or eleven years before we got married, because I would never get married while my mother was living. No! I wanted to take care of her when she got old and sick.... My husband was also still taking care of his mother.... I was satisfied the way I was. I had plenty of time to raise a family. I was an old maid at thirty, but I was happy to be an old maid. My friends were all married with four or five kids. Some of them were divorced. I didn't want that. My mother had sixteen children, and I was right in the middle, so I learned in a hurry. I made good money, I dressed up well, I went dancing -I was having a good time. Nobody was telling me what to do and when to go to bed. On trouve aussi dans Asmokeag les témoiganges de deux autres ouvrières franco-américaines : Antonia Bergeron : "We had a lot of misery" et Marie Proulx : "A Life of Glory, to Work in the Mills"
Source : Tamara Hareven and Randolph Langenbach, Amoskeag: Life and Work in an American Factory-City (New York: Pantheon Books, 1978), 201-211. 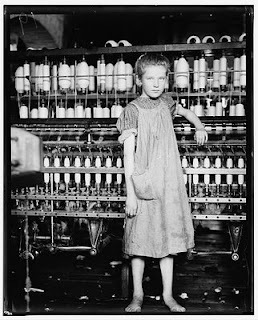 La photographie est de Lewis Hine (1874-1940). Elle représente une jeune ouvrière de l'usine de coton de North Pormal dans le Vermont. Voir ce site.